This is an excellent movie that takes chances. The whole cast is great, but the standout is James Russo as Frank. Russo never goes over the top. Frank just wants to live his life quietly. He is forced into violence. Theresa Russell, Michael Rooker, and Steve Railsback also put in very good performances. It is very unpredictable. When Frank and Dora (Russell) find a box full of money, other characters get involved including dirty cops. Usually James Russo is in Z-grade junk like (Deep Core, The House Next Door, Sonic Impact) It is nice to see him in a good movie for once. 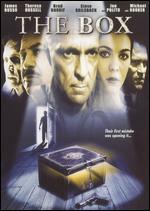 In the end: If you want to see a solid, tough crime drama, watch The Box.